You can download a backup of your theme in the Design & Assets -> Upload/download theme section. Clicking the Download your theme button will download a copy of your theme to your computer with all of it’s current settings. Once you have downloaded a backup of your theme, go the the Design & Assets -> Theme Gallery section, and click the Update my templates to use this theme button next to the theme you are currently using. This will apply the latest version of your theme to your store. Once you have done this, you’ll need to update the settings in the Design & Assets -> Theme editor -> Theme Settings section. If you do update your theme, and find that you’re unable to get your store working in your new theme, please upload the backup of your theme to switch back to how your store was originally. This can also be done in the Design & Assets -> Upload/download theme section. Once you have done this, please contact us by email for help. section is reset when you update your theme, so you’ll need to upload your logo, set up colour schemes, subscribe forms, slideshows, social media links, design preferences etc again. You should make a note of what setting you had in every section of your theme editor before updating. You should also download a backup of your theme to retrieve your logo and any slideshow images. Any design modifications that have been made to your theme’s CSS and theme templates are wiped out when you change themes. Every file in the Design & Assets -> Theme editor section. Please contact us by email if we have added any non-standard functionality or design modifications to your theme before updating it. All of your products, orders, collections, customers, email templates and uploaded files (in the Design & assets -> Uploaded files section). Data from your menus remains the same, but you may need to re-select your menus in the Design & Assets -> Theme editor -> Theme Settings section. The slideshow size is now slightly larger. Small tweaks to the layout to increase the slideshow size. New support for most social media accounts… including Instagram, Pinterest, Facebook, Google +, Flickr, LinkedIn and YouTube. 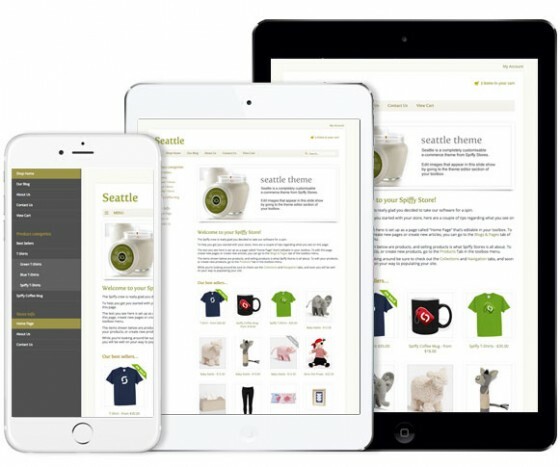 Fully responsive, with layouts for most common mobile devices. New more modern mobile menus. Once you have updated your theme, you’ll have the option to support Customer Accounts. You can enable Customer Accounts in the Preferences -> Checkout & payment section of your store’s Toolbox. Download a backup of your theme in the Design & Assets -> Upload/download theme section. Turn on customer accounts in the Preferences -> Checkout & payment section.